Chobe Savanna Lodge offers guests sweeping views, excellent game viewing and tranquility in the East Caprivi, Namibia. Chobe Savanna Lodge overlooks the vast floodplains of the Chobe National Park's Puku Flats. This lodge near the Chobe National Park is situated in the East Caprivi of Namibia on the northern bank of the Chobe river. 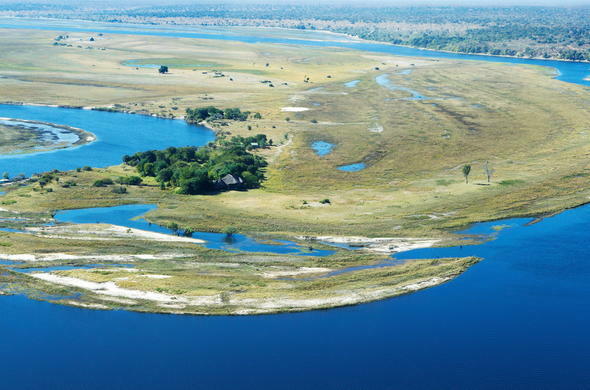 Guests can explore the Chobe River by boat, taking in the scenic sights or enjoy fishing for Tiger Fish and Bream. Guests are accommodated in 24 air-conditioned thatched chalets each featuring a combined bedroom / lounge area. Each chalet is elegantly furnished and boasts a private deck. The chalets also feature en-suite facilities and complimentary mini bars. The surrounding area is home to a wide variety of African wildlife, including the rare puku antelope. Large herds of Hippo, Buffalo and Elephant come down to the Chobe River's edge to drink and graze. After game viewing, guests can visit a cultural village and learn more about the local people's traditional lifestyle.